﻿PSMA PET/CT informs and assesses radiotherapy for prostate cancer post-surgery. RESTON, Va. – For prostate cancer patients who have rising levels of PSA (a cancer indicator) even after radical prostatectomy, early treatment makes a difference. In a study featured in the December issue of The Journal of Nuclear Medicine, Australian researchers demonstrate that PET scans can identify which of these prostate cancer patients would benefit from salvage radiation treatment (SRT). Results of the study, which ultimately included 146 men of whom 99 received SRT, show an overall treatment response after SRT of 72 percent. Among patients with a negative PSMA, 44 percent (27 of 60) underwent SRT, while 56 percent (33 of 60) did not. The negative PSMA group that received SRT had an 85 percent treatment response (23 of 27), while 65 percent (22 of 34) of the negative PSMA patients not receiving SRT experienced increases in prostate-specific antigen (PSA). For those with disease confined to the prostate fossa (36 of 99), 83 percent (29 of 36) responded to SRT. For men with nodal disease (26 of 99), 61 percent (16 of 26) had treatment response following SRT. The study demonstrates that PSMA PET can independently predict treatment response to SRT. Men with negative or fossa-confined PSMA have the highest treatment response to SRT, while men with cancerous nodes or distant disease have a poor response. In particular, a negative PSMA PET predicts a high response to SRT. FIGURE: PSMA PET/CT before-and-after salvage radiotherapy. A 69-year-old man presented with rising PSA (0.16ng/ml) following radical prostatectomy for Gleason score 7 prostate cancer 4 years prior. PSMA PET CT showed a solitary pelvic node with no prostate fossa recurrence. The patient underwent salvage radiotherapy including both fossa and pelvic node fields. 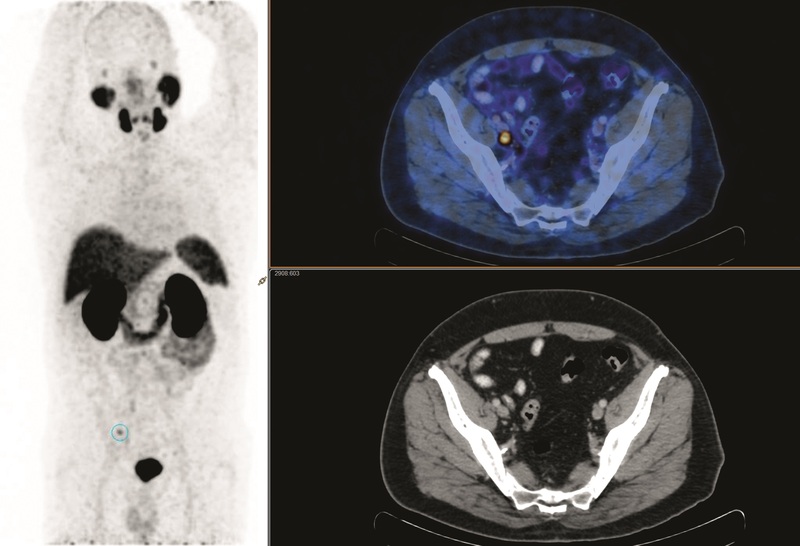 PSA continued to rise, and repeat PSMA imaging showed new sites of PSMA-avid nodal disease in the common iliac region, directly above the radiotherapy field. Credit: L Emmett et al., St Vincent’s Hospitals, Sydney, Australia. Authors of “Treatment outcomes from 68Ga PSMA PET/CT-informed salvage radiation treatment in men with rising PSA following radical prostatectomy: Prognostic value of a negative PSMA PET” include Louise Emmett, Garvan Institute of Medical Research/The Kinghorn Cancer Centre, St. Vincent’s Hospital, and University of New South Wales, Sydney, Australia; Pim J. van Leeuwen and Matthijs J. Scheltema, Australian Prostate Cancer Research Centre, New South Wales, Australia; Rohan Nandurkar, University of New South Wales; Thomas Cusick, Phillip Stricker and Quoc Nguyen, Australian Prostate Cancer Research Centre and Garvan Institute of Medical Research/The Kinghorn Cancer Centre; George Hruby, Andrew Kneebone and Thomas Eade, Royal North Shore Hospital and Genesis Cancer Care, Sydney, Australia; Gerald Fogarty and Raj Jagavkar, Genesis Cancer Care; Bao Ho, St. Vincent’s Public Hospital; and Anthony M. Joshua, Garvan Institute of Medical Research/The Kinghorn Cancer Centre.